Cunard's latest ship, the Queen Elizabeth, has had a pretty busy first week in service, including a visit from Her Majesty the Queen. After arriving in Southampton on Friday the Queen Elizabeth hosted a pre-naming party where around 800 travel agents and VIPs attended. Iglucruise were among those to be the first onboard to enjoy the regal, art-deco inspired ship. 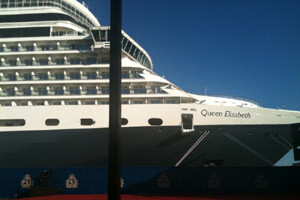 On Monday Cunard's Queen Elizabeth was officially named by The Queen, becoming the third ship to bear her name. Opposed to the usual celebration of smashing a bottle of champagne against the hull, Cunard had opted to use a jerobeam (double magnum) of 2009 Rothschild white wine. The ceremony was followed by the crowd enjoying patriotic tunes including Land Of Hope And Glory in a quayside ceremony. The Queen then enjoyed a tour of the ship with the ship's captain, Chris Wells, and enjoyed the unveiling of her portrait from artist Isobel Peachey, the youngest women to be commissioned to paint the monarch. The Queen Elizabeth also played host to celebrities such as Jimmy Saville, Lesley Garett and Judith Chalmers, with the latter singing her praises; "I love everything, the wood, the art deco design, the Golden Lion pub. It’s very luxurious and seems lighter than the Queen Victoria. I want to cruise on this ship." On Tuesday the ship set sail on her maiden voyage, a 13 night Canary Islands cruise - taking in ports such as Lisbon Tenerife and Madeira. She may be the the newest ship in the fleet but Cunard are really stepping up their game and the Queen Elizabeth is no exception. The stunning sister ship of the Queen Victoria is proving to be even more popular than expected.